We had a great tournament! And there are so many people to thank! Thank you to all the teams for participating and the Mustangs – Roberta Steele, Barb Cruden, Cindy Chan, Leah Hilton, Carla Mackey, Stacy Caruso- Sharpe, Ginnie Gardner, Joanne Lafrancois, Kathy Davis, Sheila Manz, Michelle Dickerson, Amy Wilder, Hope Matis, Pam Mantas, Sue Butler, Erin Beaulac, Page Salenger, Keri VanNatten, Dawn Zakowicz for their support, donating their time, off-ice officiating, getting and making raffle items, baking, setting up, cleaning up (you get the picture). 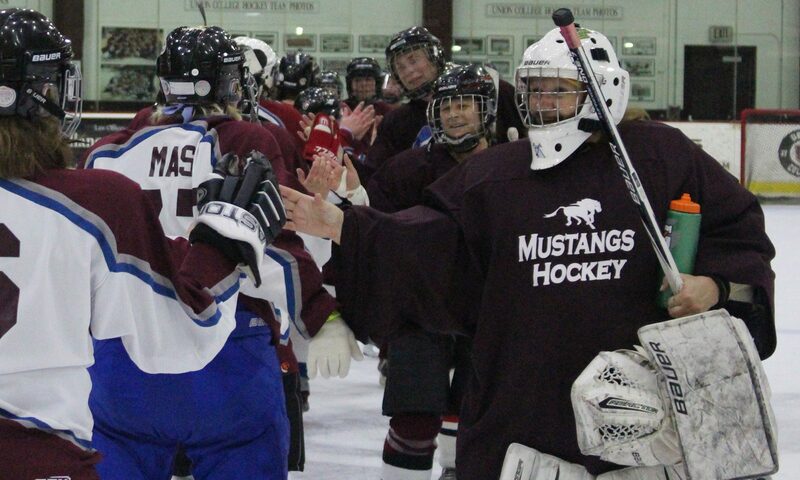 Our off-ice officials – Dan Beaulac, Olivia Dickerson, George & Margaret Soqoian, Amy Willbrant, Larry Pulvirent, Dan Spanbaur and family, Mike & Millie Faulkner, Sarah Saucier, Paul, Heidi Dillenbeck and the Mustangs! The refs that donated all or part of their time – Bill Dickerson, Mark Giemza, Andrew Goyer, Tom Dugan, Chris Caruso, James Collins, Karen Evans, Stephanie Wyld, John Hirliman. To our Champion Sponsors – Christopher Jackson and the Borisenok Family – Thank you!! To our Fan Sponsors – Adirondack Beverage, Golub Foundation and Benjamin Edwards & Company, Dave Roberts & Rosanne Sundstrom, Irene Petito, Stacey Caruso Sharpe, Roberta Steele and Terry Laibach – Thank you!! To our Wall of Courage Sponsors – Capital District Renal Physicians, ABC Players, Kahn and Richardson, James and Margo Strosberg, Lurie & Co., CPA, Dr. David Civale, Neah Likhite, Jim Honan, Dicky & Kristine Croce, Jen & Dave Kruman, Barb Allen & Gary Lanphear, Sue Butler, Carol & Greg Braungart, Happy Scherer, Janet Hawkins, Dave Elliot, Charlie & Suzy Scott, Luke Nally and Dan Eaton – Thank you!! And thank you to those that donated items to our silent auction and raffle-Adam Brinker, Albany Devils, Amy Wilder, Andy Alpart, Arctic Foxes, Barb Cruden, Bert Steele, Buffalo Bills, Buffalo Sabres, Carla Mackey, Cathy Bowman, Cindy Chan, Colin Stevens, Craig, Chris, Bryan Jackson, Danbury Battle Axes, Dawn Zakowicz & Paul, Erin Clark, Gary Carter, Goldstocks, Happy Scherer, Heidi Dilllenbeck, Hoffmans, Honest Weight, Hope Matis, Joan Ma, Joanne Lafrancois, Judy Fregoe, Kathy Zakriski, Kris & Chip, Linda Locke, Lorinda Hill, Margaret Novak, Max Gordon Fitness, Maxine Alpart, NHL, NJ Devils, NY Giants, NY Jets, NYSDEC, Pam Mantas, Pam Wilber, Proctors, Saratoga Storm, Saugerties Nightmares, Scott’s Hallmark, Shannon Woodley, Sheila Tandon Manz, Simon Alpart, Staten Island Yankees, Terry Laibach, TriCity Valley Cats, Union Men’s Hockey Team, Upstate Kayak Rental, ShopRite, Mikes Restaurant, Mario’s Restaurant, Freihofers, Manhatten Bagel, Hannafords and Price Chopper. Thank you to Adam Brinker and the Rink Team – Barry, Sean & Phil! And last but not least – Craig, Christopher and Bryan Jackson – couldn’t do this without them!! Shoot out for the Rec championship game! Very exciting!!! At this link there is a sub-folder titled “Around the Rink” for non-game pictures. There are other sub-folders labelled by game where players can scout for pics. I tried to get as many people as I could, and game action too. There are pics for every team, but I couldn’t cover every game, and some of the games got short treatment. The folders for the champ games all have team pictures. If you are interested in the 2018 tournament (date will be mid-March), send me an email.